After the visit, we dropped Doug off at his office and were given the keys to the car that we were able to use for the weekend. We went for a beer and a snack at a local brew pub, and then out to Stanhope, where Dave’s relatives live. 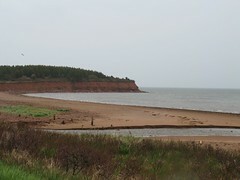 Stanhope is due North of Charlottetown, on the North shore of the island. It really is an idyllic setting! Dave’s aunt and uncle live next door to each other, which made it easy to visit with both families. We had a dinner and caught up with everyone. Saturday we went into Charlottetown and wandered around town. We had lunch at a lovely little bakery and then wandered down by the quay to have some Cows ice cream (What trip to PEI is complete without some Cows ice cream!?). In the afternoon we made another visit to the nursing home, then headed out to the Paderno store. 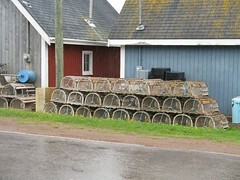 Paderno pots are made in PEI. 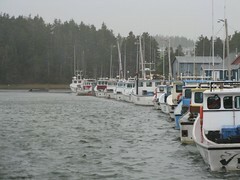 Then it was back to the house for a dinner of fresh lobster (literally the lobsters were dropped off by the fisherman on his way home). Yummy!! Monday morning we drove around a bit to find a gas station to fill up the car we had been using all weekend, and then said goodbye to the family. We were back in Ottawa in the early afternoon. All in all it was a nice trip. It was good to get to know some of Dave’s family from his Dad’s side, and also to see PEI again, as I hadn’t been since I was a kid. I know it was difficult at times for Dave to see his grandparents as they are now. As he says, they are shadows of the people they used to be. At times they are there, and at others they aren’t. But I think he enjoyed the trip overall as well, especially getting to hang out with his aunts, uncles and cousins. Submitted by Jenn (not verified) on Fri, 2009-05-22 19:27. I'm glad you were able to get a chance to go visit. I wish we had time to go!